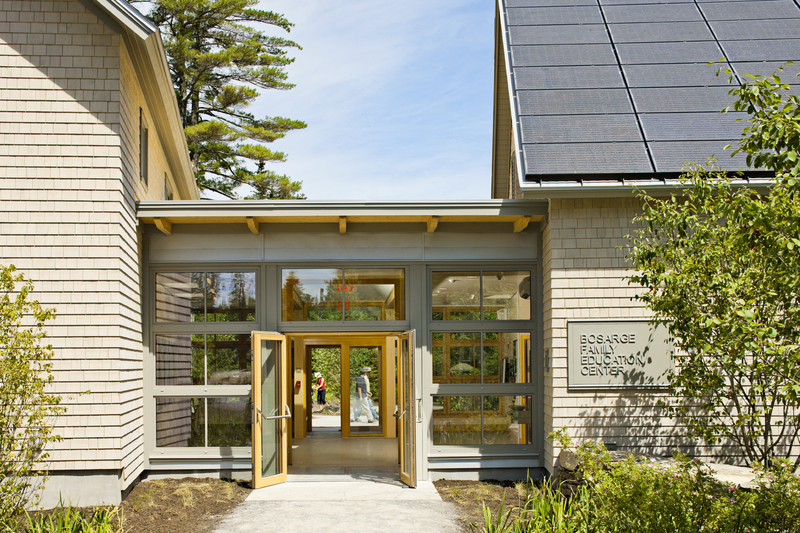 The Bosarge Family Education Center at the Coastal Maine Botanical Gardens was designed through a collaboration between our firm, and a local Maine architecture firm, Scott Simons Architects. 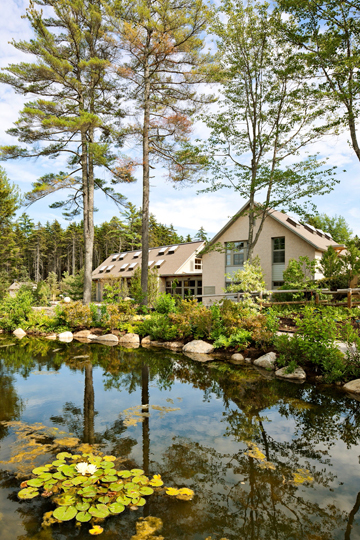 The client wanted to construct a new education center adjacent to their existing visitor’s center to serve as a model of sustainable, energy-efficient design. From the outset, the client outlined strict environmental guidelines with the goal of a LEED-Platinum, net-zero, beautiful building blending into the context of the surrounding gardens. 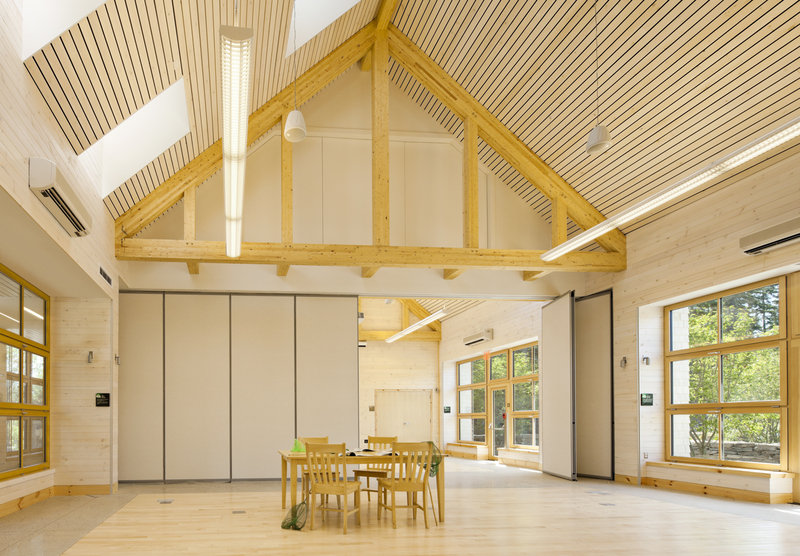 The building was also to be an active teaching tool by outwardly demonstrating energy and resource conservation to visitors. 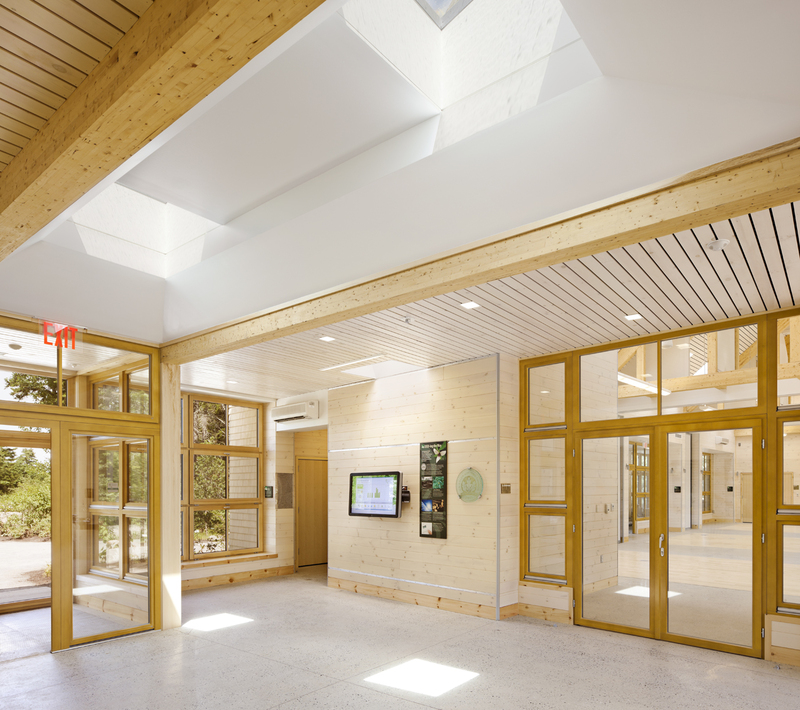 This net-zero building is designed around a central open gallery: a gateway to the gardens. Two wings extend from this central core into the landscape, one housing administrative functions and the other flexible public space. Extensive glass enhances the connection to nature for occupants. The pre-determined site was a confined parcel adjacent to an existing visitor’s center. Located in a valley, this site presented a challenge to the design team of maximizing the solar access critical to net-zero performance. In addition, the client wanted to preserve as many of the large coniferous trees as possible. The site, along visitor’s central circulation path, allows the staff to be connected to the arrivals and departures of guests. The orientation of the building allows for the use of passive solar strategies, optimizes the orientation of the roof-mounted PV and solar hot-water panels, and minimizes the impact to the existing site and trees. 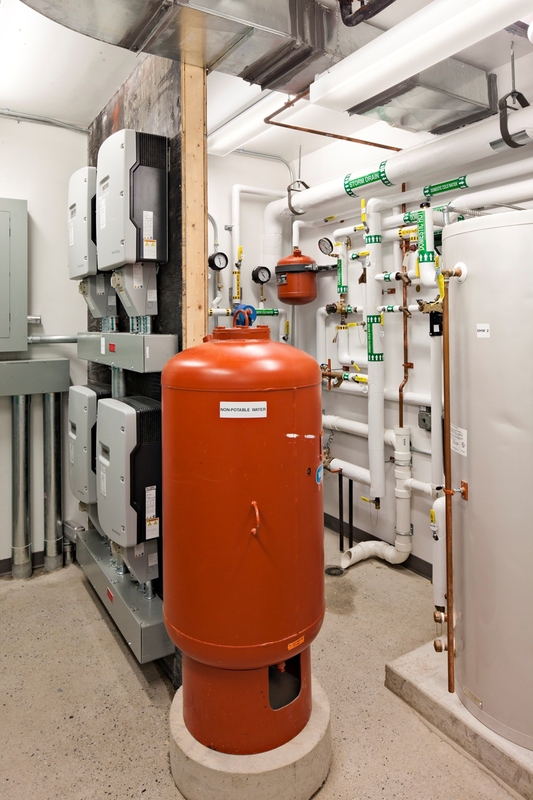 Meters provide real-time energy data for all systems. 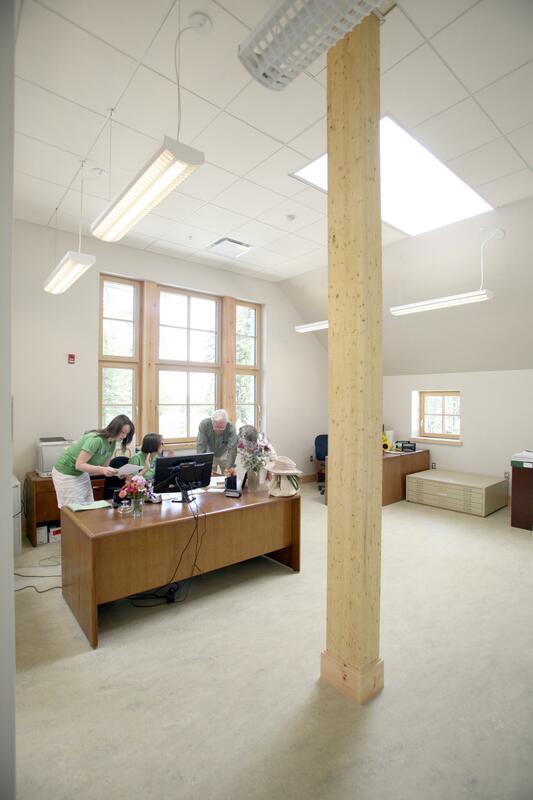 Signage and a “truth wall” educate visitors about the buildings sustainable features. 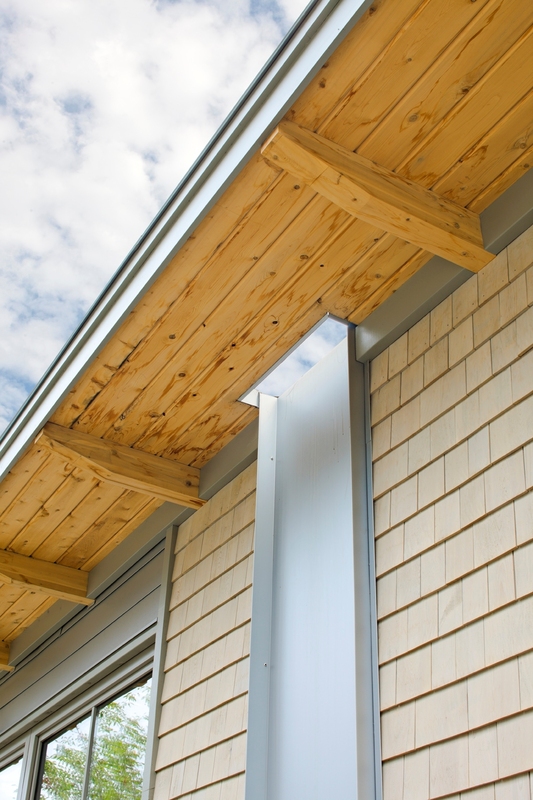 The highly insulated building envelope, high levels of daylight, and automatic controls optimize occupant comfort. The client set forth a strict schedule for the project in order to preserve the experience of visitors during the high summer season. To meet this tight schedule a panelized construction system was used which allowed for off-site fabrication, minimized on-site waste, site impact and time. 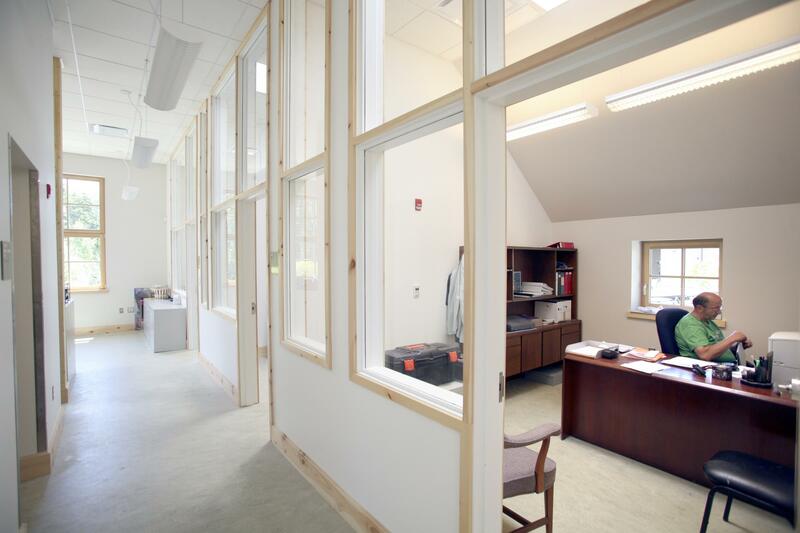 This project is the first net-zero project by our office completed utilizing a panelized system, and through careful thought and construction, it meets the air infiltration standards required for net-zero buildings. The panelized process offers a level of control and precision in a factory environment. The envelope design and building assembly now established within the prefabrication parameters can be adapted for other projects.